Ganon, an evil beast who holds the Triforce of Power has invaded the kingdom of Hyrule. Princess Zelda has been imprisoned and now he seeks the Triforce of Wisdom. Link, a brave young elf, is tasked with collecting the Triforce fragments hidden in dungeons around the kingdom. Only then will he be strong enough to face Ganon. 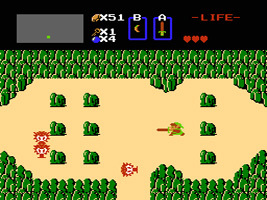 Starting out with only a shield, Link must seek out the eight dungeons, arm himself with weapons and items,	and face the monsters that stand between him and the Triforce. Hyrule is filled with secrets that may assist Link in his quest. Find out more about the characters, enemies and items you will find as you explore the fantasy world of Hyrule. Find out more about the hidden secrets found in The Legend of Zelda.